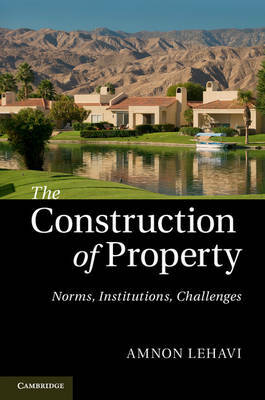 The Construction of Property identifies the structural and institutional foundations of property, and explains how these features can accommodate various normative agendas. Offering rich and cutting-edge analysis, the book studies the spectrum of property regimes including private, common and public property as well as innovative forms of property hybrids such as US-style residential community associations, the British Private Finance Initiative, the Israeli Renewing Kibbutz, community land trusts and grassroots phenomena of property ordering in publicly-owned open spaces. It also investigates the protagonists of property beyond the individual and the state, identifying the key role that community organisations and business corporations play for both the private and public aspects of property. The book then addresses property's greatest challenge: the move from a largely domestic legal construct into one that accommodates the increasing social and economic forces of globalisation.